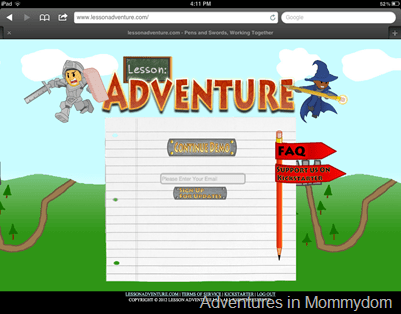 adventuresinmommydomblog | Learning Adventures at the SPEED of FUN! 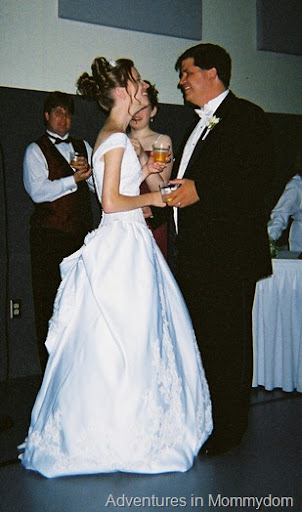 At about this time 10 years ago today I was getting married. That is, if I’ve remembered the time of my wedding correctly. I think I am. My brother Chad gave me away. My Dad had died about a month earlier from cirrhosis, or as my kids call it bad roses. It’s a little hard to explain to a 3 year old, which is when they first figured out there was no Granddad to go with Mimi. I mostly remember everyone trying to stuff food into me as we got ready, because everyone was sure I was going to pass out from low blood sugar. 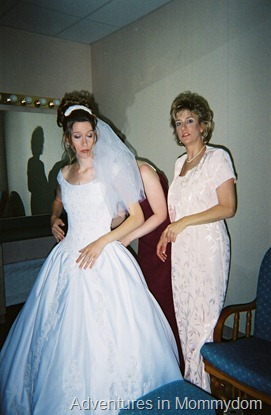 At the same time they were paranoid about anything getting on my dress or messing up my make up. It made for some interesting attempts to eat. It was kind of funny to look at the picture of my family. It’s changed so much since this picture. 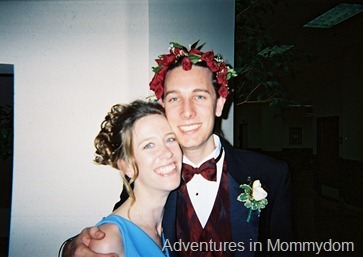 My brother Chad and his wife had a baby boy about two months before my twins were born. They had another boy a little after Princess (if I’m remembering the timing right). My brother Sean just had his first baby with his wife about a month or so ago. A boy. Poor Princess is the only girl grandbaby on my side of the family. Another side note. My train is called a “cathedral length train,” Jeff says that is incorrect because it was not the entire length of the church, so it is not cathedral length. His theory is it should have been on a runner and unrolled as I walked down the aisle. Then we could just walk back up it. I thought the dress I got was hard enough to walk in, never mind his idea. We had swing dancing at our wedding. 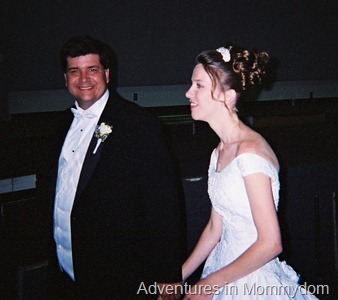 According to my version of how Jeff and I met, we met at a swing dance our church hosted in the same gym our reception was in. 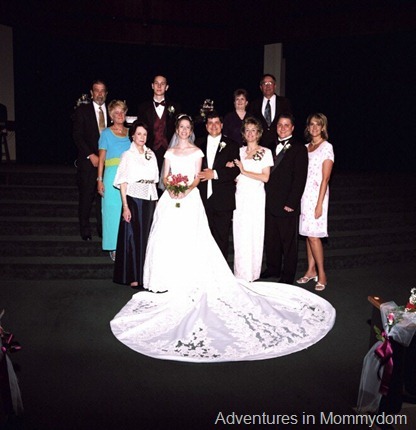 Sigh, I don’t think I’d fit in that dress now. That’s probably a good thing. I was rather underweight from the stress of my first year teaching, and my Dad being sick, and various other stuff. I needed to gain some weight, I’d prefer to lose 5 pounds of vanity weight now, but otherwise I’m at a much healthier weight now. 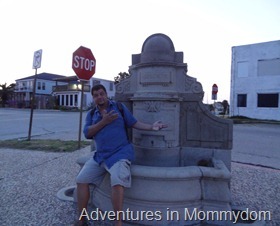 My computer crashed a few years ago, so on my computer I mainly have the pictures my Mom emailed me that were her favorites that she has. 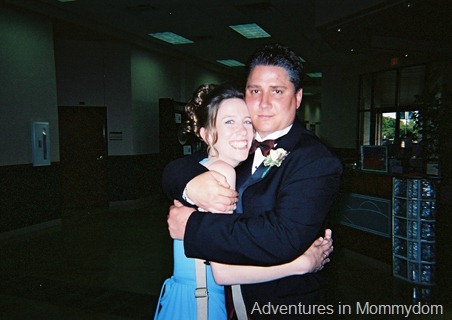 I’ve got hard copies of all of them in my wedding album, and I plan on spending some time with Jeff tonight looking through it and my honeymoon pictures. Pretend these are pictures from our honeymoon, and not from the trip we just took to celebrate our anniversary. Those were all on film, and are quite nicely stored in a scrapbook. Jeff completely spoiled me and we went to London. We saw “Midsummer Night’s Dream” at the Globe (PUCK! * A thoroughly awesome production with an awesome Puck!). We went to the British Museum almost everyday. We saw the Peter Pan statue. 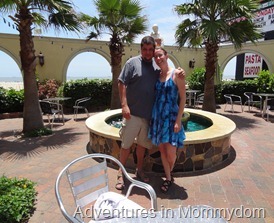 We went to a book store that was an ENTIRE CITY BLOCK and 5 STORIES HIGH! When we returned our suitcases were stuffed to the gills with books and clothes. We had to bring clothes back because it would have been rather silly to leave them there. It barely all fit in the suitcases. ** Completely unrelated story, but I’ve found my new current favorite book series that has Puck as one of its main characters. Any time you can throw fairies into a story, you can almost guarantee it’s good. Almost, if it’s not then Jeff gets to hear me complain for a very long time. A friend of mine is in the process of starting a new computer game for kids. 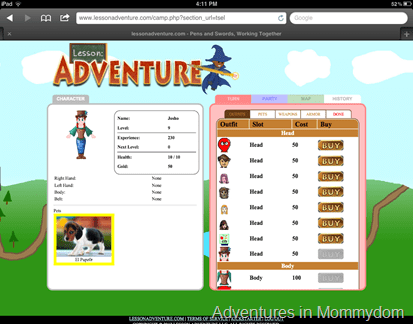 So far it’s called Lesson Adventures. It’s a fun concept, it takes a little bit of Oregon Trail, a little bit of a fantasy theme, and puts it together into a computer game, which my boys would love to play more of. They can’t yet because right now it requires being able to read, and I really don’t want to read all of the quest text to them. But, it’s going to provide a great incentive to learn to read. They have a demo up with some questions for the 8th grade classroom that is trying it out. This is your character sheet. As you complete adventures you get paid money based on how well you’ve done. You can get armor and different things to make your character look different. My boys loved what I called the “Wookie look,” and I was corrected it’s the Wolfman. Right now it’s a fairly straight forward quest chain. You accept the quest and go out and defeat slime monsters and skeletons by answering questions. The plan once the game is live is to let you put in material your class is covering, and the game will make a quest for you. Doesn’t that sound like a more interesting way to study and review than just drill and kill? I’d have loved it as a kid. Now, why am I bringing this up? Well, they’ve got a kickstarter for Lesson Adventures going on right now. So, please help them out and check it out. My kids set up the toys for small group a few days ago. This is what they did. 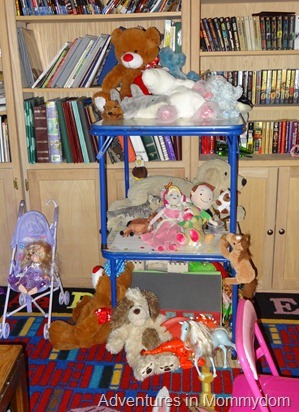 They stacked two tables on top of each other and then created these homes for their dollies. Why did I title this “like Mother, like child?” Because Jeff went upstairs saw this and came down saying that. See, back when Jeff and I were dating I had a BRILLIANT idea! I mean BRILLIANT. I was going to take my twin sized bed, and put it on top of a bookcase, and then two pillar bookcases. The only problem is those pillar bookcases were rather shaky MDF, and the other bookcase was some plywood, that had been through a few too many moves. Oh, and there’s a good chance they weren’t all the same size. But, I was still sure this was a BRILLIANT idea, until Jeff started talking. Then he pointed out the not so brilliant parts of this. The shakiness of the bookshelves, the likelihood of collapse and a few other things. One, how much of our kids behavior is nature and how much is nurture? As far as I know my kids never heard that story, or any of my other BRILLIANT home decoration ideas. Yet they came up with similar ideas. There are many things I can see of me in my kids. Phrasing and ways they talk, but there’s some things I have no clue where it came from. Princess actually cares about clothes, she’s very picky about them and she LIKES clothes shopping. The other thing it got me to thinking about, is how well Jeff was designed for me. He provides a push when I need it, which isn’t often, but mostly he is the brakes. See I come up with a lot of BRILLIANT ideas. A LOT. Thankfully, Jeff is around to tell me when that isn’t the best use of my time or talents. Some things Jeff has stopped me from doing: volunteering to sew an entire bridal party of clothes, volunteering to lead several different ministries, volunteering to watch extra kids, and volunteering to do all sorts of things. All right, my random introspection is over, and now I’m going to work on some Sunday school stuff. 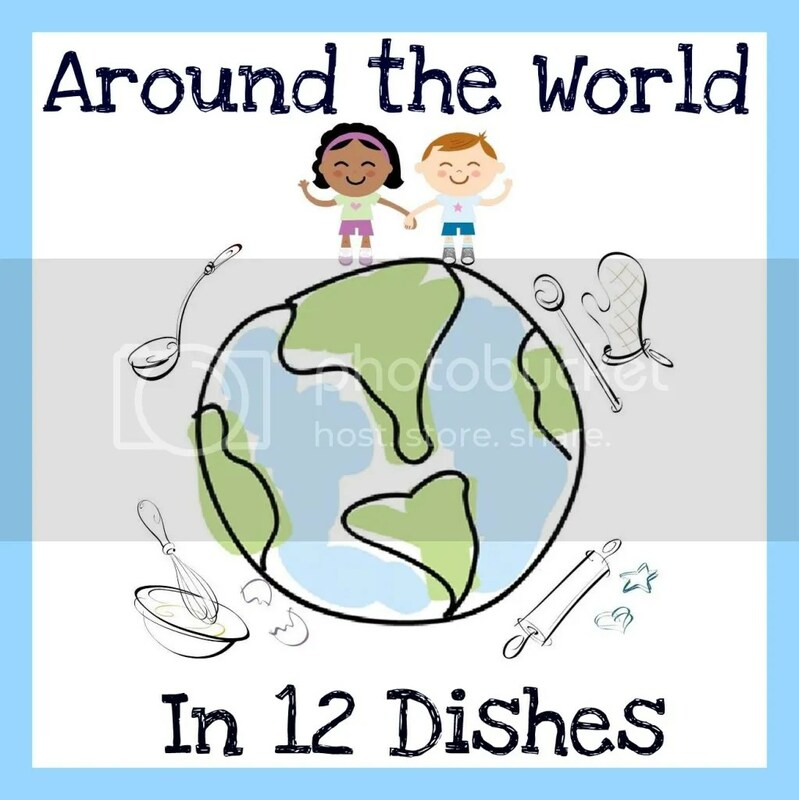 Welcome to “Around The World in 12 Dishes”. As we travel around the world we’re going to learn about 12 different countries as we eat 12 different dishes. Adventures In Mommydom, Creative Family Fun, Glittering Muffins, Juggling with Kids, Kitchen Counter Chronicles, Make, Do & Friends, Mermaids’ Makings, Mom 2 Posh Little Divas, Mummymummymum, Rainy Day Mum, Red Ted Art and The Educators’ Spin On It have come together to help you on your food journey and will each cook a dish with our children and post about it – to help inspire you to have a go! 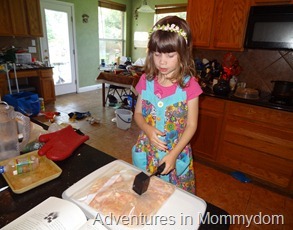 Then go out there, cook, blog, and join in the linky fun! I’m gonna start this off by saying I’m not a big fan of Indian food. Mainly because I don’t like curry. So my personal mission was to find something that didn’t involve curry. And I did. But to make it I needed tandori paste. So, we went to our local Indian grocery. 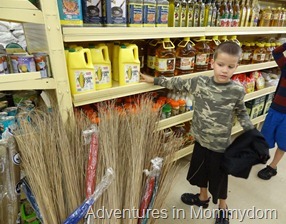 We explored the differences between our grocery store and what they have. It’s a fun experience. They have many of the same things, but have a few interesting additions. Namely spices, and specialty items. 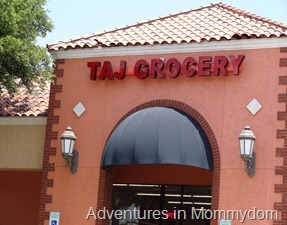 I highly encourage you to go check out the different cultural grocery stores. I know my area has Mexican, Asian, and Indian. I look forward to seeing what others we have. We’ve now gone to the Asian and Indian markets. But, we got the items we needed: tandori paste, and I got some more sesame oil. I love to use that for cooking. It’s got a great flavor. 1. 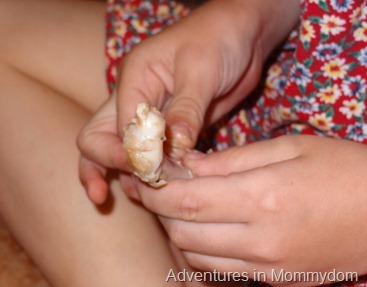 Pound the chicken to about 1/4 inch to 1/2 inch thickness. Princess quite happily helped me pound it flat. Side note, this is a good time to trim off the fat, it wasn’t included in the directions. 2. Measure out 1/4 cup of tandroi paste. Pour into galon sized ziploc bag. Measure out 1 cup of plain yogurt. 3. Smush it all together. This was quite popular with Princess. 4. Mince 1/2 onion. Add into the sauce. Then put in chicken breasts and let marinate for several hours. 5. While it’s marinating take about 1 cup of plain yogurt, the cucumber peeled and diced, and 1/4 cup of minced onion together for the sauce. 6. Cook the chicken. You can grill it or cook in oven at 375 for 10 minutes or so. 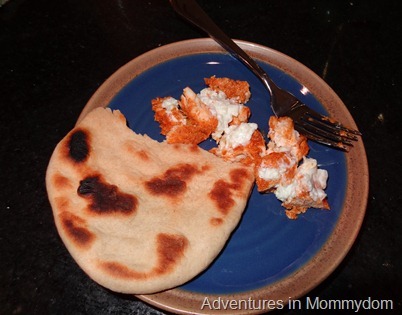 Serve with pita bread or rice. I was lucky and had a friend make fresh pitas for me (SCORE!). END RESULT: While they kids enjoyed cooking it, after I tried it, and discovered it was almost too spicy for me. I did not serve it to the kids. I knew that would be a horrible idea. Horrible, horrible idea. So, I can’t give you their opinion. I knew they would not like it. 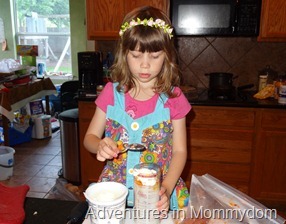 Have you ever had a recipe you were sure was going to work go so horribly wrong? 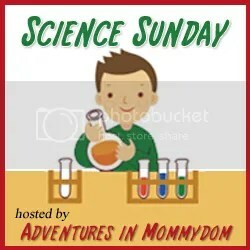 Science Sunday: Why are our bones strong? After much talking and debating among my three children they decided to go with Land Animals for our next science to study. But, Superman really wanted to learn about skeletons, I think that’s the only reason he was looking at the Anatomy notebook because it had a skeleton on the front. Seriously. 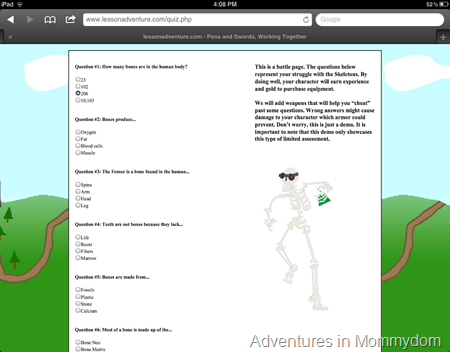 I made him a deal, what if before we start learning about land animals, we learn about skeletons? He was okay with that. I had picked up the “Magic School Bus Explores the Human Body Science Kit,” thinking it looked really cool. 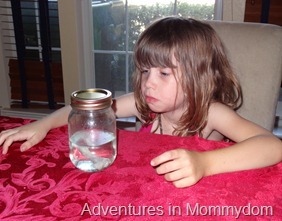 I’d seen Enchanted Homeschooling talk about some of their kits a couple of times and it looked very intriguing. 1. Get a rotisserie chicken for dinner, and enjoy it. Then don’t let your husband throw away the bones. 2. Explore the bones. This is a great chance to try descriptive terms. Slimy, dense, hard, rubbery. 3. Discuss the cartilage at the end of the bone. Also point out a few ligaments and tendons that are still attached. Think to yourself, this is kind of gross. 4. 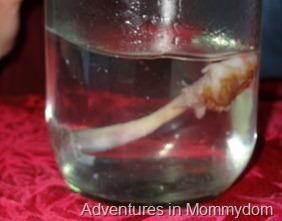 Predict what will happen to the bone while it’s in the vinegar. 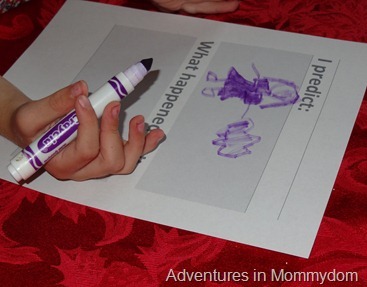 My kids had no clue what would happen, so they went for SUPER silly! 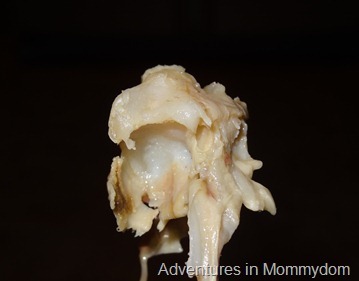 Princess said “A Princess will come out of the bone and make flowers!” Ummmmmm, not so much. 5. Obsessively check on the bone for the next day or so. Pout when you’re not allowed to touch it. 6. Take the bone out. Discover that you can bend it. Talk about how the vinegar took the calcium out of the bone. Calcium is what makes our bones hard and strong. This is why we drink milk. 7. 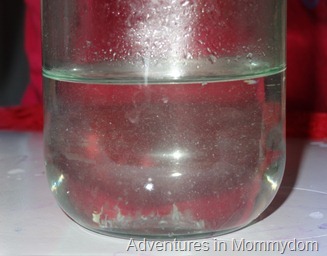 Observe the dissolved calcium in the jar. Think to yourself, that’s kinda gross. And that’s our first part of skeleton studies. I’ve been busy getting ready for the kids to go to grandparents while Jeff and I celebrate our 10 year anniversary this week. I was going to do more, but I had other things on my mind……… A lot of cleaning. 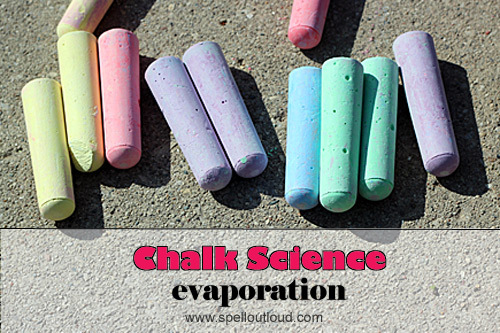 Spell Out Loud did a great preschool evaporation activity. 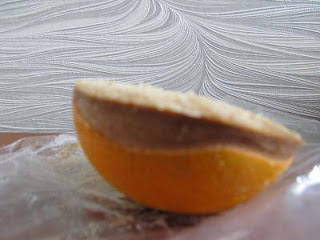 The Usual Mayhem has a post for the strong of stomach about mold and fungus (with added bit at the end about the useful parts of fungus and mold……). Almost Unschoolers has glow in the dark fake snow. Now to hunt down a UV source……..
I’m sure you’ve all done things like this. Previously we’ve rolled giant dice and added the numbers then run to the chalk number on the floor. Now, we’re practicing counting for money (nickels, dimes, quarters) using a ball. Just throw it in a circle and count whatever it is you’re practicing. Here we’re counting quarters. 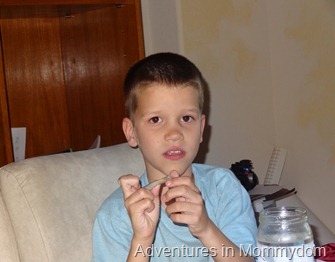 The kids much prefer to count pennies. As a side note, this ball is actually from when I was teaching. You’re supposed to solve the math problem that is closest to your right thumb. 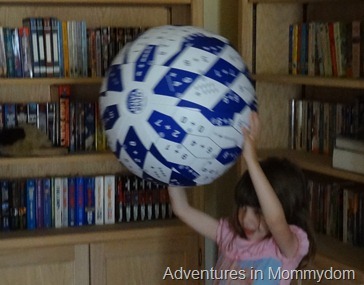 Good for practicing left and right, and hand eye coordination as you’re throwing it around. My second graders loved it. I’ve got similar ones for elements of story. Those ask all sorts of reading questions. I need to get them out for my kids.